Like it or not, the world of retail has changed. And while brick and mortar stores certainly aren’t going anywhere, they’re still going to need to adapt to the changing world around them. In particular, stores – including bike shops – must start accounting for the way today’s customers prefer to do business. How do consumers make purchasing decisions today? Simple. First, they gather information through online research and social media before they zero in on any potential seller of a product. When the customer arrives at their chosen seller, they can then be swayed through "related items" online features. Or, for a brick-and-mortar store, a sales person has significant influence on what a shopper walks out the door with. The problem is, too many bike shops think that the influence of a salesperson is such an important part in the process that they willingly disengage from the first part of the process - online research. But, the fact is, more often than not, the shopping journey begins online, which means the salesperson won’t even have an opportunity to close the deal unless and until that research leads those prospects through the door. The process of online research before a purchase is so common these days that it actually has its own name. It’s called webrooming, which is basically, the opposite of showrooming, and according to Forrester, it’s directly responsible for bringing in about $1.8 billion dollars for retailers each and every year. According to Retail Wire, 88% of people say they webroom online before ever stepping foot in a physical store. Furthermore, one survey found that today’s consumers spend an average of 79 days gathering information before making a major purchase. That’s a lot of time. And guess what. If your merchandise isn’t available for them to find online, it’s also a golden opportunity for your competitors to swoop in and win those sales. Many bike shop owners will say, "I don't want to put product on my website. I want customers to come into my store so my sales team can help them find the right product." That is certainly a valid business strategy. But on the whole, it simply doesn't line up with the realities of retail as it stands today. In order to get the customer through your door in the first place, they need to know you have the thing they are looking for. Ideally, the shopper will have the most up-to-date and accurate information about your selection as possible before they head over to your shop. Don’t think this is important? Just consider new research conducted by Google that found that one in four shoppers say they’ll steer clear of a local store if they can’t go online and easily find information such as the availability of an item, pricing, store location or hours of operation. They don’t want to waste their time. To the contrary, when shoppers are successful at finding the info they’re looking for online, they are actually more inspired to visit the physical store. Perhaps most surprising are the demographics of these findings. Would it shock you to know that 89% of Millennials say that access to real-time product information online would inspire them to head to the store and make a purchase? It’s true. Despite the fact that this generation always seems to be online, they actually prefer to make their purchases in-store. And with a buying power that’s expected to top out at $1.4 trillion annually by the year 2020, that’s a statistic retailers simply can’t afford to ignore. Another important point to consider is the opportunity that a website provides for engaging with customers and improving their overall shopping experience. The fact is, today’s consumers visit stores for more than just a final transaction. Ideally, they want to feel that the retailer understands them. 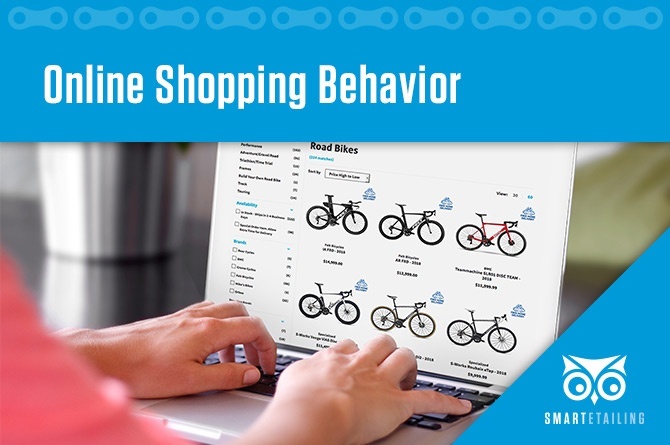 Bike shops can take advantage of this by offering personalized coupons and exclusive in-store offers to online visitors. As a result, 85% of shoppers say they’d be more likely to come in and shop offline. All of these facts and figures boil down to one thing. Having a catalog-enabled website is an absolutely essential component of modern retail. But creating and maintaining this type of website is challenging for small business owners. That's where SmartEtailing can help. Our website solutions make the process of building your online content and maintaining accurate pricing and availability easy. Still not convinced? Take us for a test ride with a free product demo, or contact us directly and let’s discuss how we can work together.